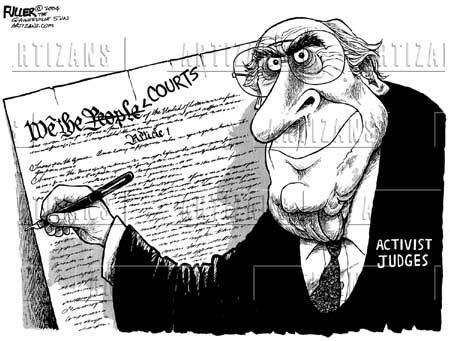 Judicial activism involves interpreting the U.S. Constitution and the nation’s laws to achieve some non-legal, socially desirable leftist/liberal end favored by judges. Politics trumps the law. How many citizens of these seven countries actually work or attend a college or university in the state of Washington, and of that number how many are not within the borders of the United States at this time? Is it likely that there are sufficient numbers of them that their absence for another 90 days will actually cause the State of Washington – not the institutions or employers, but the state itself – irreparable harm? It is reasonable to believe that there are relatively few people in these circumstances, and that the harm would be of little significance to State of Washington. Interestingly, U.S. District Judge Nathaniel Gorton in Massachusetts reached the opposite decision earlier the same day. He understood the law that gives the president the exclusive authority on national-security grounds to impose the temporary suspension on travel to the U.S., and that under the U.S. Constitution immigration is under control of the president, not the judiciary. The administration appealed Robart’s flawed ruling to the Ninth Circuit Court in San Francisco, and the three judges who heard the appeal predictably upheld the initial ruling, since this appellate court is notoriously liberal/activist, and has the reputation for being a federal court whose decisions are frequently overturned by the U.S. Supreme Court. Neither Robart nor the three Ninth Circuit judges – William Canby Jr., Richard Clifton and Michelle Friedland – dealt with the actual law giving the president the authority to do what Trump did in any meaningful way. They acted outside their narrow area of authority and improperly interfered with lawful actions by the president. Since Robart issued the temporary restraining order on February 3rd, 77 percent of 1,100 immigrants/refugees that had entered the U.S. at the time the situation was analyzed came from the seven countries in the travel suspension, a substantial increase since before the order was issued. Constitutional law scholar and conservative talk radio host Mark Levin termed the appellate court’s decision to uphold the stay as “disgraceful” and “pathetic.” Levin points out that the court has improperly conferred due process and constitutional rights onto this class of individuals. Judicial activism does not always create potentially dangerous situations, as this incident has, but all activism is harmful to some degree, and must end.